Like clockwork, the holiday staples begin appearing on the shelves of Argentine markets around the first week of December: blue and red foil-wrapped pan dulce, packets of cavity-inducing turrón and Mantecol, and bottles of bubbly sidra. When it comes to baked goods, nothing else says Christmas in Argentina like pan dulce, a sweet yeast bread known to most Americans as panettone. Popularized by Italian immigrants, pan dulce has become an indispensable part of holiday celebrations in Argentina. To be sincere, I could never get that worked up about pan dulce. 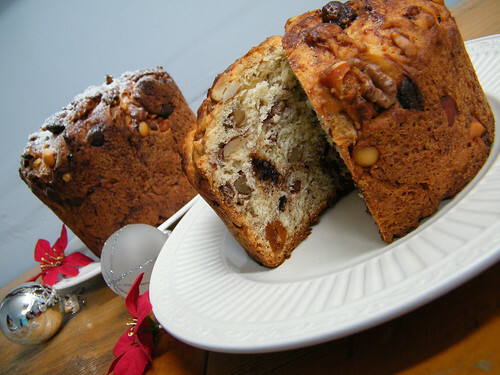 The ubiquitous, commercially made version generally suffers from one or more of the following defects: dry, tasteless dough; an excess of unappetizing candied fruits (cherries should never be green in my opinion); and a dearth of the ingredients that I really enjoy, such as walnuts and almonds. The pan dulce available at local bakeries generally raises the bar, but if you’re after customizability, homemade pan dulce simply can’t be beat. 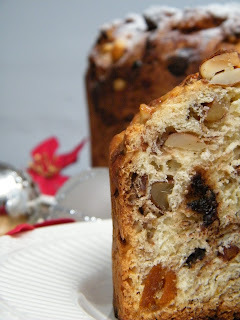 This recipe yields a rich, flavorful dough chock full of nuts, along with homemade candied orange peel and chunks of chocolate. The dough, perfumed with orange blossom water, will make your kitchen smell divine as the bread bakes. Though the recipe is a bit time consuming, I assure you that you’ll never go back to store-bought pan dulce after sampling the homemade version. Feel free to tailor the recipe to your taste. If you love those green cherries, go ahead and add them. Combine the ingredients for the sponge, and leave the mixture to rise and bubble in a warm place until it has doubled in volume, roughly 30 minutes. Place the eggs, lemon zest, vanilla extract, almond extract, orange flower water, and malt extract in a medium bowl and mix well. In a food processor or in a large mixing bowl, mix the flour, butter, salt and sugar. Add the egg mixture to the flour mixture and mix. Add the sponge to the mixture, and stir to incorporate. Turn out the dough onto a lightly floured work surface and knead with your hands. Use up to 1 cup of additional bench flour to knead the dough until it is smooth and elastic and no longer sticks to your hands, about 15 minutes. Shape dough into a ball, and place in a greased bowl, covered with a kitchen towel. Allow dough to rise in a warm, humid place, until it doubles in volume. Note: The richness of the pan dulce dough (high sugar and fat content) as well as the large quantity of nuts, chocolate, etc. results in long proofing times. Be prepared for the dough to take several hours to proof, especially in the case of the first rise. Punch down the dough, and place it on a lightly floured work surface. Using your hand, flatten the dough into a large rectangle. Sprinkle the dough with the nuts, candied orange peel and chocolate, and knead the dough briefly to evenly distribute the add-ins. Form balls and place them in paper panettone molds that have been brushed with butter. The dough should fill half the mold. Cover with a kitchen towel, and let the dough rise in a warm, humid place until it doubles in volume. Cut an ‘x’ in the top of the dough with a very sharp knife. Brush the dough with melted butter and beaten egg yolk. Bake the large pan dulce for about 1 hour, the medium one for 45 minutes, and the small one for 30 minutes. If the top starts to brown too much, cover loosely with aluminum foil. The pan dulce is done when it is brown on the outside and sounds hollow when you tap the bottom. Allow pan dulce to completely cool on a wire rack. Sprinkle with powdered sugar, if desired.